One Sefton resident is counting the benefits of stopping smoking with Sefton’s free stop smoking service. 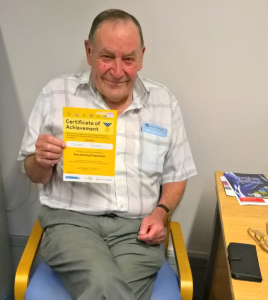 George Travers, from Bootle, went to Smokefree Sefton’s clinic at the May Logan Centre and is delighted that he has said goodbye to cigarettes. “I have been smoking most of my life, at least 20 per day. I’m in my seventies now and was unsure if I would ever quit. Thousands of people in Sefton have also successfully quit smoking with the help of the borough’s free stop smoking service. Smokefree Sefton, a partner of Living Well Sefton and managed by Solutions 4 Health, offers professional support in a variety of community venues to make it easier for people to get the help they need to stop smoking. If you would also like to stop smoking then ring Smokefree Sefton, which is commissioned by Public Health Sefton, on 0300 100 1000 for details.